Would-be entrepreneurs from the universities of the SETsquared Partnership have recently been pitching their business ideas at Deloitte in London in a competition to encourage student enterprise. The winners came from the Universities of Bath and Exeter, who had to present their business plans to a panel of experienced consultants from leading business advisory firm Deloitte. 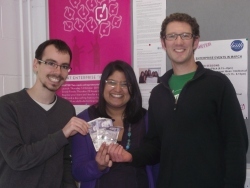 Of the 21 students who presented their plans, the judges awarded two prizes of £100 and two of £50. The winning business plans ranged from workshops for children to a customer-friendly chain of garages. During the 5 minute pitch, the students had to clearly articulate their business idea, be passionate about their product and show some evidence that they had researched the potential market. They then had to take feedback from the panel. “Presenting a well-argued business case is an essential skill for future employability and success,” said Siobain Hone, student enterprise co-ordinator at the University of Bath and the competition organiser. Lena Chudasama, final year International Management & Modern Languages, University of Bath. Her idea was Healing Feeling workshops for children to improve their confidence and self-esteem. She won £100. Tom Humphries and Sam Knight, both second year, reading Political Economy & Philosophy and International Relations respectively, University of Exeter. Their idea was Yes4Uni, an idea to franchise an organic sexual lubricant. They won £50. Stephen Baldwin, final year Physics, University of Bath. His idea was Earsoft, a tool to tune out distortion to make watching videos on a phone or computer clearer. He won £50. There will be another occasion to showcase and celebrate student enterprise activities across the SETsquared Partnership in June.